The St. Mary’s University Law Alumni Association honored three graduates – John M. Vaught (J.D. ’78), the Hon. Jennifer A. Rymell (J.D. ’91) and Javier L. Herrera (J.D. 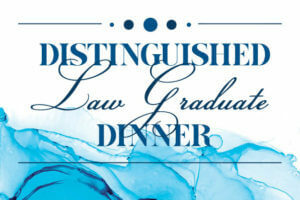 ’10) – at its annual Distinguished Law Graduate Dinner on Saturday, Oct. 6, at the Grand Hyatt San Antonio. The Association hosts the event to fund scholarships and student services. Vaught is senior counsel at Wheeler Trigg O’Donnell LLP in Denver and is president of the Colorado Bar Association. Vaught has extensive class action defense experience for insurance companies, as well as extensive securities litigation experience. An AAA-trained mediator, Vaught helps litigants resolve complex disputes outside of court. While at St. Mary’s, Vaught was associate editor of the St. Mary’s Law Journal. Rymell has served as judge of Tarrant County Court at Law No. 2 in Fort Worth since 2003. Rymell presides over a general civil docket. Prior to serving on her current bench, she served as a municipal court judge for the City of Fort Worth, an assistant disciplinary counsel for the State Bar of Texas and an assistant county attorney in Parker County. She is the chair of the Judicial Section of the State Bar and has been a section board member since 2015. Herrera is an attorney with the Herrera Law Firm in San Antonio. He currently serves as one of the American Association for Justice Minority Caucus board of governor representatives and the vice president of finance for the San Antonio Trial Lawyers Association. While studying at St. Mary’s Law, Herrera was a member of the Board of Advocates, the St. Mary’s Mock Trial Team, the Hispanic Law Student Association and worked two years serving clients in the law school’s Center for Legal and Social Justice.